Summer is always such a busy time of year for my family! Father’s Day is coming up next weekend. After that, there are six birthdays – including mine – to celebrate throughout the summer. Then, at the end of July, I’ll be celebrating my 5th wedding anniversary. Basically, the summer is one great, big party for us! That’s why I’m starting to stock up on all of my Father’s Day, birthday, and anniversary cards. I’m also brainstorming a bunch of fun gift ideas, starting with Father’s Day! The summer’s not just about one celebration after the other in my family. It’s also fishing season! If there’s one thing that the dads in my family have in common, it’s that they love to go fishing. Ever since I was little, I’ve spent most of my summers on a boat. Now, my husband and I have our own boat. I don’t do much fishing these days, but my husband and his father seem to go out almost once a week during the summer! So this Father’s Day, I wanted to put together a simple fishing kit since handmade gifts are the most heartfelt gifts. This DIY fishing kit has all of the basic essentials for a day out on the water. It will be great to have on the boat just in case they forget something back on land! My husband and I usually make a Walmart trip together about every other weekend to grab a few items that we need around the house. But I left him home during my last trip so I could start preparing for our summer celebrations. While I was there, I got everything I needed to make my Father’s Day fishing kit. I was also able to get all of my American Greetings cards for the summer, including a birthday card and anniversary card for my husband, and wrapping supplies! You’ve got to love one stop shopping! So you might be asking yourself, “What are some basic fishing essentials?” Well, besides a fishing rod (and I know the dads already have their fishing poles ready to go! ), there are a few items every fisherman should have on hand. Not just for fishing, but to protect themselves from a day out in the sun, as well! 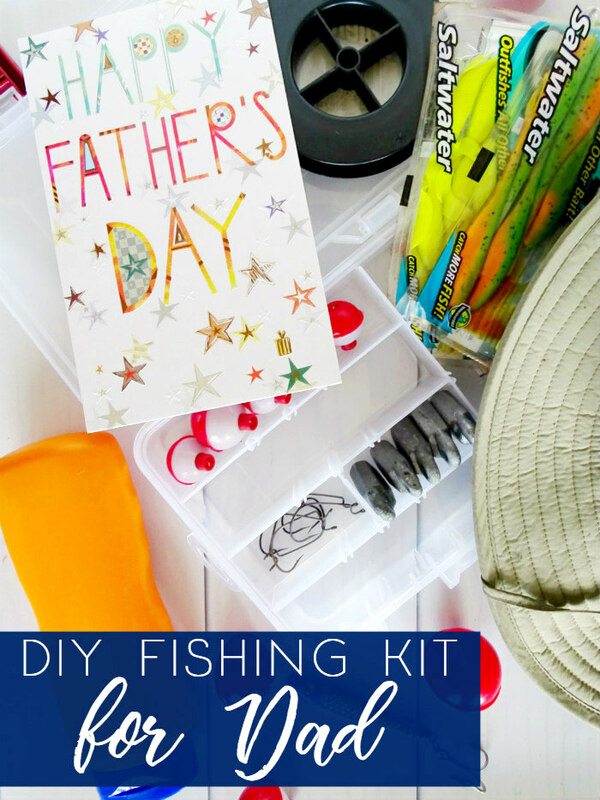 If you’re not sure what to get the dad who loves to fish this Father’s Day, this kit will definitely be appreciated! Take small items out of their packaging (like hooks, lures, and bobbers) and add them to a tackle box organizer. Larger items (sunscreen, sunglasses, a hat) can be wrapped or put into a gift bag. Don’t forget the Father’s Day card! Wrap everything up in a gift bag with a little tissue paper and give it to your favorite fisherman for Father’s Day! You’ll be able to find everything you need to make this simple DIY fishing kit at Walmart. Stock up on American Greetings cards and wrapping supplies while you’re there! If you buy any American Greetings card at Walmart from 6/21–8/31, you’ll earn $1.00 back on the Ibotta app! It’s the perfect time to stock up on cards for all of your summer celebrations! Find everything you need to celebrate dad – Father’s Day cards, wrapping paper, gift bags, tissue paper, and more – in the greeting card aisle at Walmart! How are you celebrating dad this Father’s Day? This little tackle box is PERFECT for the occasional fisherman! Thanks! They’ll definitely have all the basics to get started with this kit! Cute, cute, cute idea!! Fishing is such a great family activity! Thanks so much! It definitely is! It was always so much fun fishing together! I love this idea! My husband has been talking about learning how to fly fish since we moved to CO. Maybe I’ll try to put something similar together for him! Thanks! That’s awesome! I’m sure your hubby would love this! This is a really great idea. I love it! GULP! baits are easily my fishing fanatic husband’s favorite bait! This is such a great gift for dads who enjoy fishing! What an awesome idea for father’s day! American Greetings has the best cards! Thanks for sharing your wonderful posts at Over The Moon Party.